The Dwarf Papyrus is literally a smaller version of the papyrus reeds that grace the Egyptian Nile. The wild species grows up to ten feet tall. The dwarf papyrus, scientific name Cyperus prolifer, grows up to two feet tall. Varieties of the Dwarf Papyrus have names like Baby Tut and Nanus. Many varieties are only twelve to eighteen inches in height. Dwarf Papyrus grows in grassy clumps. They are usually sold as a group of plants sharing the same root ball. The papyrus stems are light green with dark green tops before erupting in a head of feathery clusters. You know that the plant is dry when the tips start to turn brown. 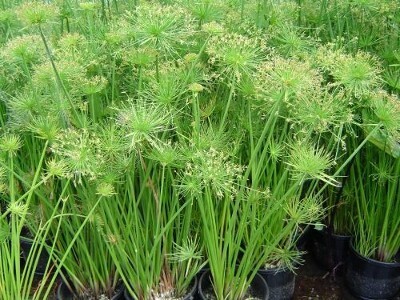 Dwarf papyrus is an evergreen plant. It grows year round unless exposed to freezing weather. Because this species is nearly synonymous with the Nile River, it is almost impossible to over-water. However, you should only apply fertilizer while watering it to avoid burning the plant. Conversely, dwarf papyrus is extremely heat tolerant, capable of surviving 110F summers if properly watered. It is so tolerant that it is a weed in many countries. Dwarf papyrus flowers in the late summer if it receives enough direct sunlight. The blooms are greenish brown and look like spikes. Deadheading the plant is not necessary. Dwarf papyrus can be grown from seeds or when the plant is divided in the spring. Dwarf papyrus can be grown as a grass, as a landscaping plant, in containers or around the edges of a pond. You can even plant it in the pond, given that it isn’t planted in more than a few inches of water. You don’t have to submerge the root ball but do need to keep it moist. In warmer climates that don’t get below freezing, dwarf papyrus is a perennial plant. If the plant freezes, it will not resume growth in the spring. You can tell that the plant has suffered cold damage when the leaves turn brown.